The blue and yellow macaw, also known as the blue and gold macaw, is a bright and beautiful parrot found in the tropics. These loud, social birds are highly intelligent, can live for many years, and remain bonded to their partners for life. Let’s learn more and be sure to test what you’ve learned with our fun quiz at the end! Let’s learn more interesting facts about blue and yellow macaws! What do blue and yellow macaws look like? The blue and yellow macaw is a brightly colored parrot. They are large birds that can reach up to 33 inches long. They have a wingspan of 40 inches or more and can weigh two or more pounds. As you might guess, blue and yellow macaws are mostly blue and yellow. However, they do have green foreheads. Blue covers their necks, backs, tails, and wings. Their chests and bellies are a golden yellow color. The underside of their wings is also yellow. Blue and yellow macaws have hooked black beaks, with a black patch of feathers just below it. Their faces are white with black rings. Unlike most birds, male and female blue and yellow macaws are basically identical. Where do blue and yellow macaws live? Blue and yellow macaws live in rainforests and savannas in tropical South America. They can be found from eastern Panama through Colombia and from Venezuela to Brazil and Bolivia. 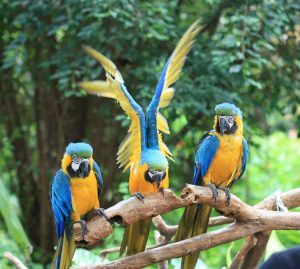 Blue and yellow macaws have also been introduced to Puerto Rico. They nest high up in cavities (holes) found in large, dead trees. In addition, these birds are popular pets who can be found in homes around the world, including the United States. What do blue and yellow macaws eat? Blue and yellow macaws mostly eat seeds, nuts, fruits, and plant materials. They especially enjoy palm fruit and the seeds of a tree called the Hura crepitans tree. Some macaws also eat mineral and salt bearing clay found on river banks. This diet is high in fat because the blue and yellow macaw spends most of the day flying through the rainforest, foraging for food, nesting, and caring for its chicks. Blue and yellow macaws are very social. They usually gather in flocks of 100 or more birds. It seems that these flocks have no leader, and all the birds are equal. Paired blue and yellow macaws fly very close together, with their wings almost touching. Once in a pair, blue and yellow macaws usually remain bonded for life. Blue and yellow macaws are very “talkative” and are known for making loud screeching noises. Scientists believe that they also communicate with feather ruffling and blushing (wow!). Watch a blue and yellow macaw talking! Female blue and gold macaws lay two or three eggs at a time. Both the male and female work together to protect the eggs. While the female sits on the eggs, the male feeds her. At first, the chicks are blind and have no feathers. Their bright feathers don’t grow until they are about 10 weeks old. Chicks remain with their parents for about a year. Blue and yellow macaws are not classified as endangered, but their population size is decreasing. In some areas, like Trinidad, the population has decreased to the point of endangerment. 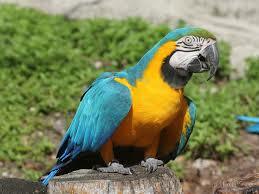 Threats to the blue and yellow macaw include hunting and the collection of chicks and young birds for the pet trade. Habitat destruction is another problem. A healthy blue and yellow macaw can live for more than 70 years. A blue and yellow macaw named Charlie is said to have lived for at least 114 years. Blue and yellow macaws are very intelligent. They can have the intelligence of a three or four-year-old human. Like other parrots, blue and yellow macaws are able to mimic humans very well. 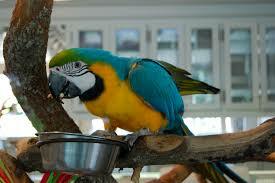 Blue and yellow macaws are messy eaters and are known to chew destructively. They have powerful jaw muscles that allow them to easily crack open a variety of nuts. While they feed on seeds, blue and yellow macaws drop many to the forest floor. In this way, they help plants grow throughout the forest. 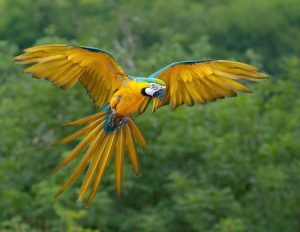 Blue and yellow macaws can fly at speeds of up to 35 miles per hour. Blue & Yellow Macaw Quiz! Test your knowledge of this beautiful bird with our fun quiz!